New feature! Aimee LoSecco of the HOT PICKS crew turns her jaundiced eye to outlandish comics of yesteryear that are patently offensive to 21st century sensibilities. 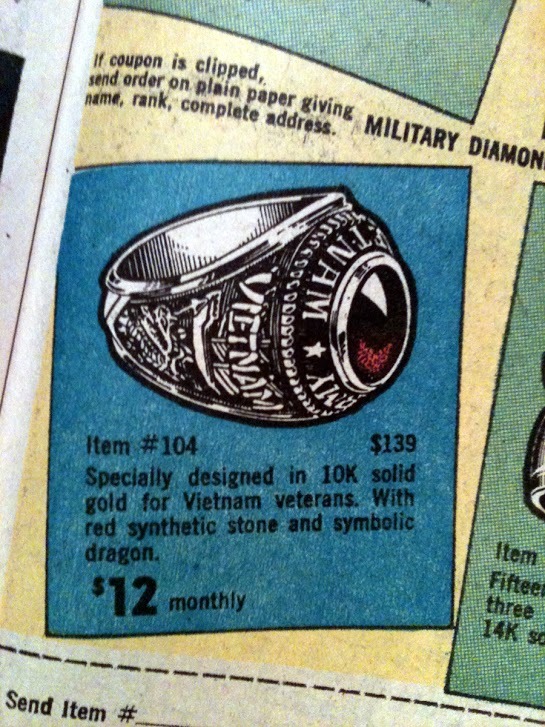 A true lost gem, this is the first of a two-issue series available only to GIs at military PX locations in 1969. No indicia, but there is a “Letter From the Editor.” The editor? 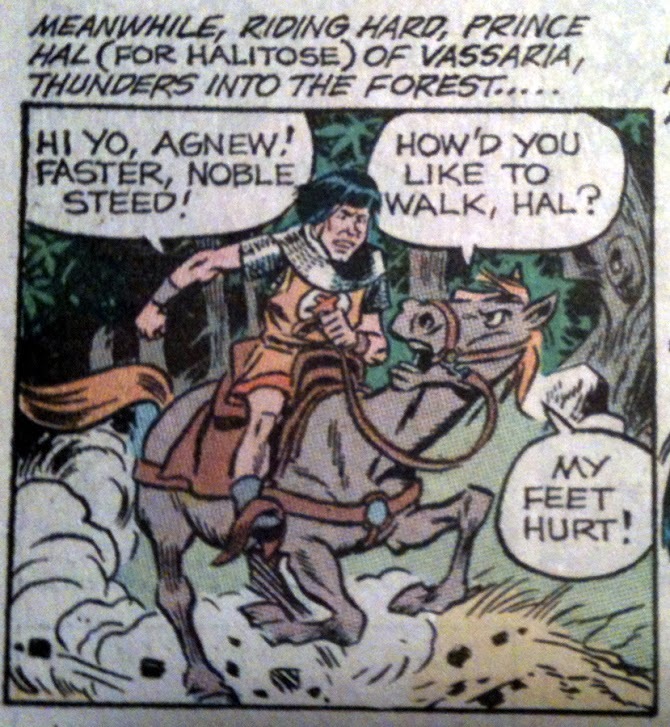 The one and only Wallace Wood. Front cover by Wally Wood. This self-published issue is pure time-capsule fun. The ads are as entertaining and offensive as the stories themselves. 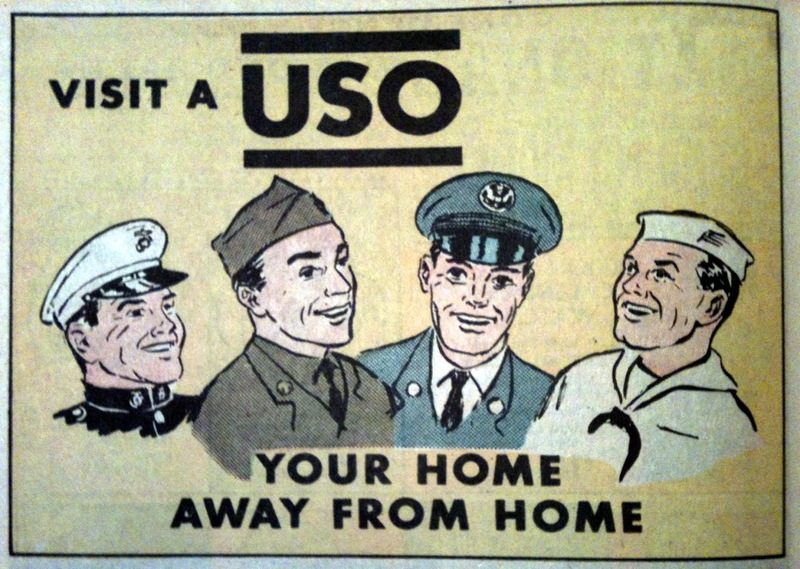 They’re all aimed at every GI’s dream: putting a ring on their fiancee’s finger, buying a piece of land, and maybe dancing with some dame at the next USO dance. Matching rings! No photos! Send your hard earned money to some random PO box! Disappoint your best gal! 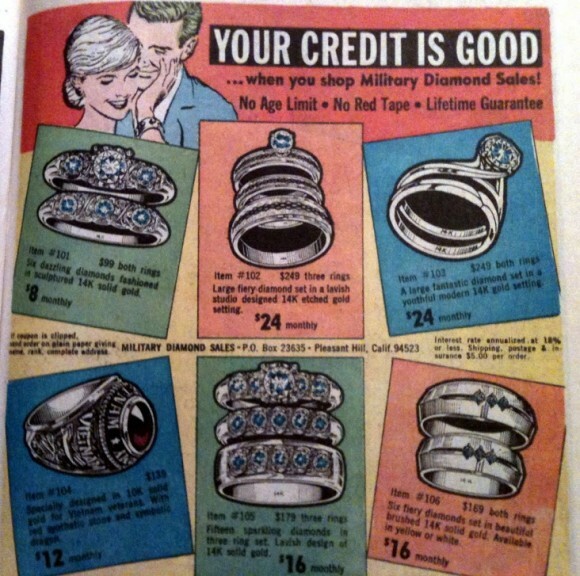 Every other ring offered in every other ad has a real stone. Our boys who served in Vietnam get glass. There’s no better way to say, “You lost a fake war, baby killer” than with a piece of red crap in a setting that will turn your finger green. One day I’m gonna cash in my war bonds and buy a mod living room set and matching slave girl to serve me sandwiches with the crusts cut off. 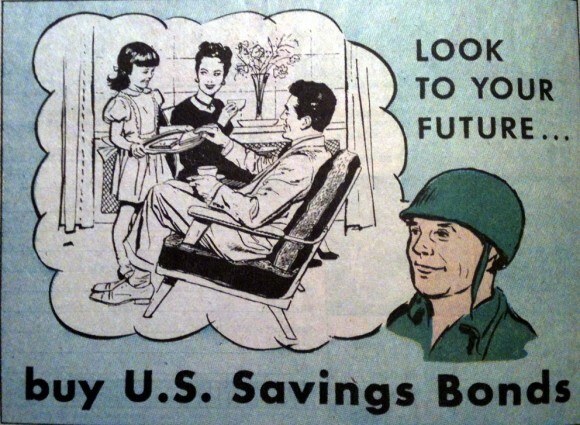 I’m gonna buy me a piece of land and start my family like in that war bonds ad! Whaddya mean it’s a desert? And I don’t own it? 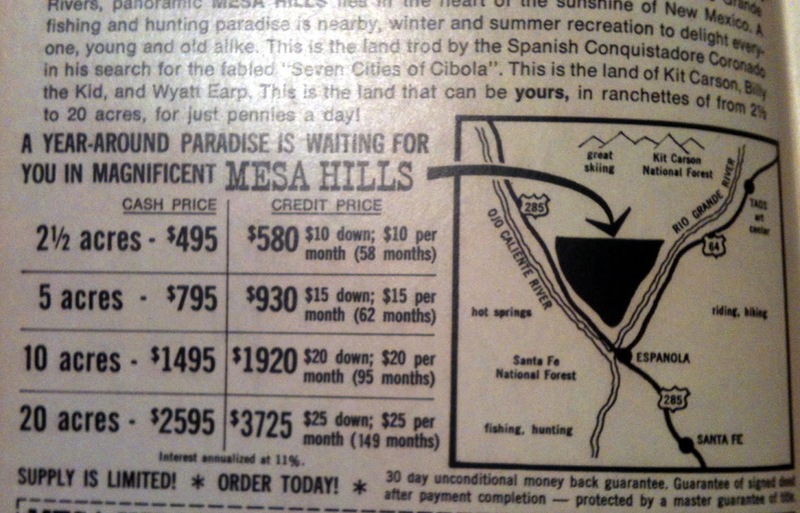 I sent that ad my two bits for 2 ½ acres! 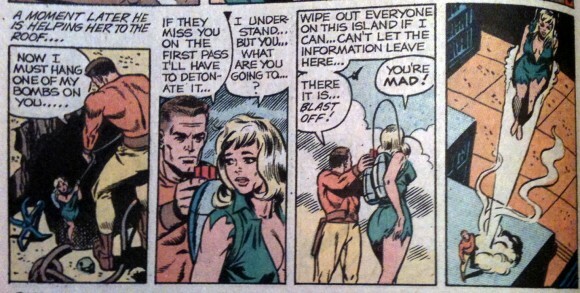 Now “Cannon” (Wally Wood writer/artist, Steve Ditko inks) is a CIA agent brainwashed by dirty Commies. U.S. scientists obliterate the rest of his humanity to make him the perfect covert agent. It’s your typical one-man-army story, complete with a buxom blonde launched over Red China with a rocket pack. She sure is a bombshell! Hyuk! 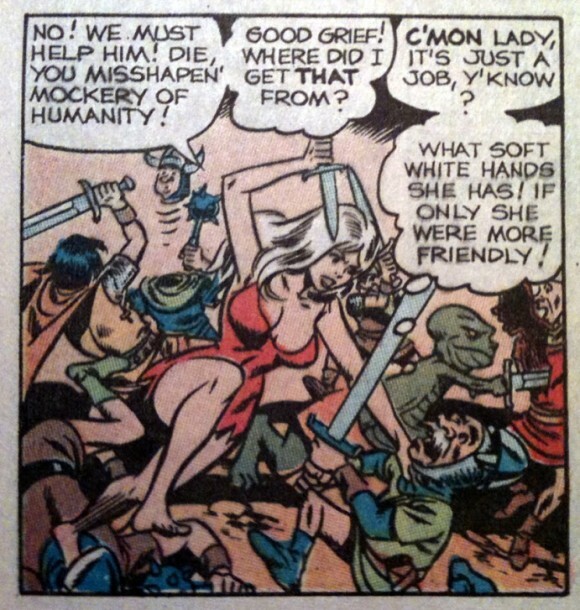 “The Misfits” (Wally Wood writer/artist, Ralph Reese inks) is a sci-fi tale revolving around three telepaths: Mystra, a nubile android; Shag, a Gleek-ish alien; and Glomb, a giant mutated baby. Apparently U.S. scientists liked to screw innocent people the eff up back then. These three try to foil an alien’s control over the earth’s humans and machines. 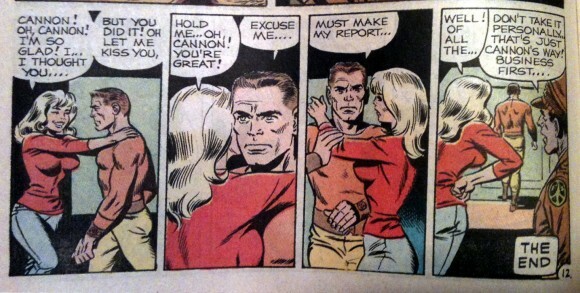 Boring, until you get to these two panels. Yep. That’s his first response. 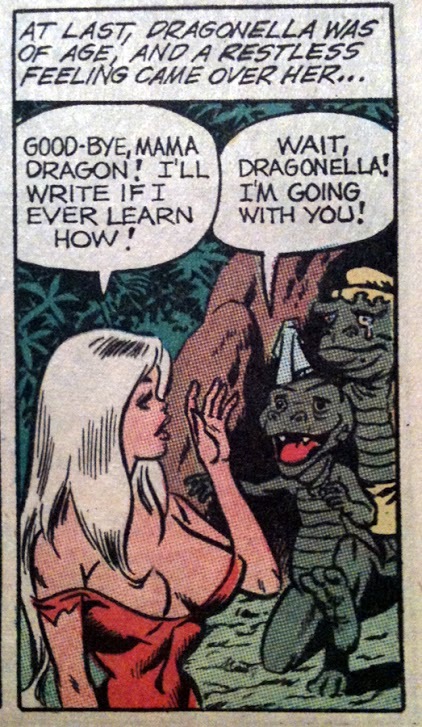 Last up is “Dragonella”, (Ron Whyte writer, Wally Wood, art) a gag strip about a dumb, stacked blonde and her dragon pal setting out in the world to find her prince. 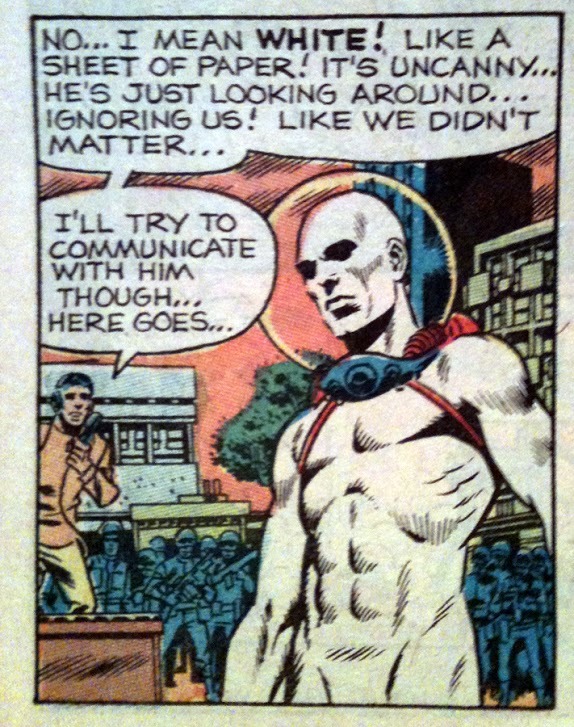 OK, that’s just good shtick. Nothing says 1969 like bad breath and Spiro Agnew. Young, stacked, violent, and speaks like Prince Valiant? *Swoon*! Let’s end with a good ol’ USO ad! Where all the broads at?! 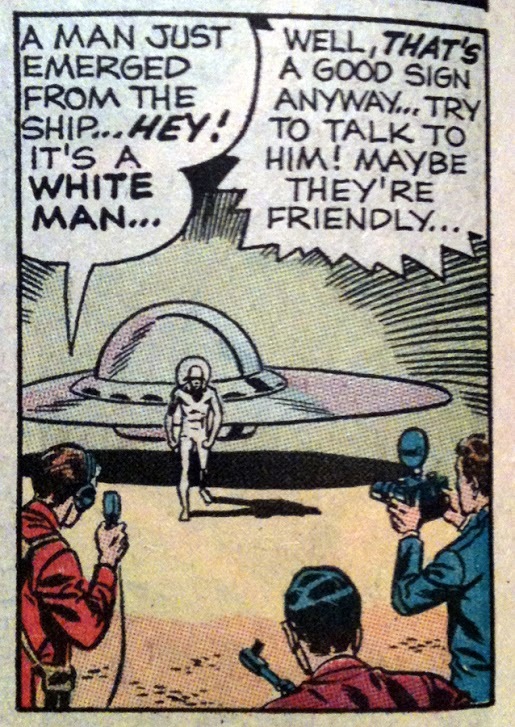 You know, I just love this comic, despite all its faults. Well this is awesome. Great idea for an article! Wally Wood was incredibly creative. Explore his early work in Witzend as well. 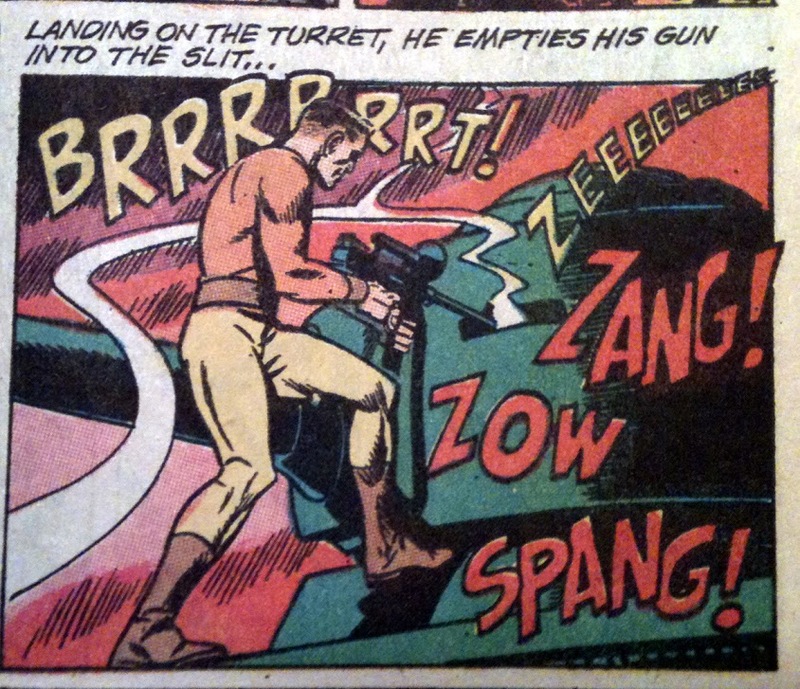 Many artists of the day were featured there like Al Williamson or Dan Adkins besides Wood’s own Animan. The late Mr. Wood will always be special to me because he offered encouragement to me as a 16-year-old wanna-be artist. He always took the time to offer advice. The Wallace Wood Estate is working with Fantagraphics to release both, the ultimate CANNON collection and the complete WITZEND. Keep an eye on The Wallace Wood Estate on Facebook for all Wood related news.